During the late 1940s and early 1950s, the Surrealist painter René Magritte made a series of "Perspective" paintings based on well-known works by the French artists François Gérard, Jacques Louis David, and Édouard Manet, in which he substituted coffins for the figures represented in the original paintings. The composition of this work is almost identical to that of David's famous portrait of Madame Récamier in the Louvre, except that the seductive young sitter has been replaced by a coffin, with a cascading gown left as the only trace of her previous existence. 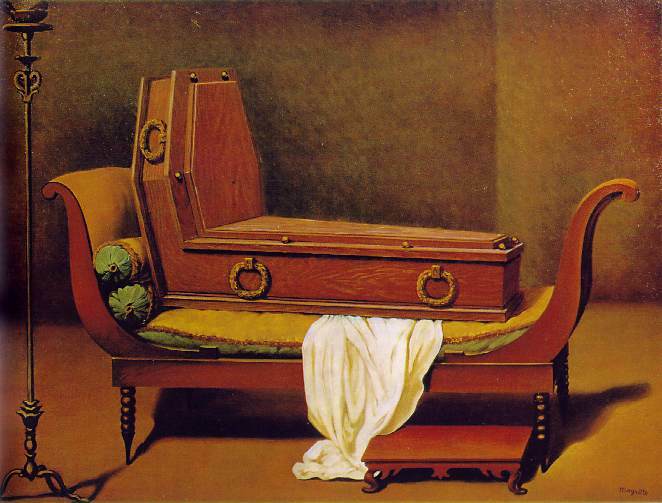 Executed in Magritte's carefully detailed style, this irreverent rendition of the Neoclassical masterpiece is suffused with mordant wit. The reason i chose this oil on canvas painting was because i love all of Magrittes work. i enjoy his use of surrealism and the oddities of his pictures.